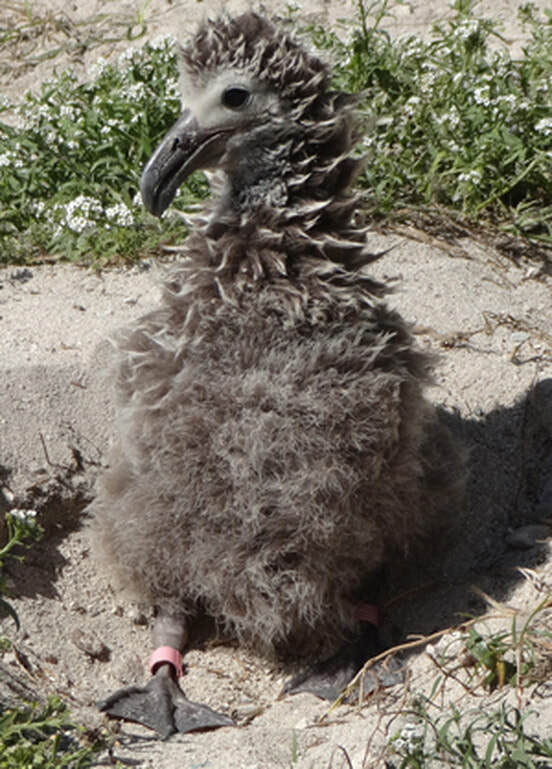 Wisdom, the amazing Laysan albatross that's been nesting each of the past 56 years in the same place on Midway Atoll National Wildlife Refuge, hatched another chick in early February and mom, dad and baby are all doing fine. 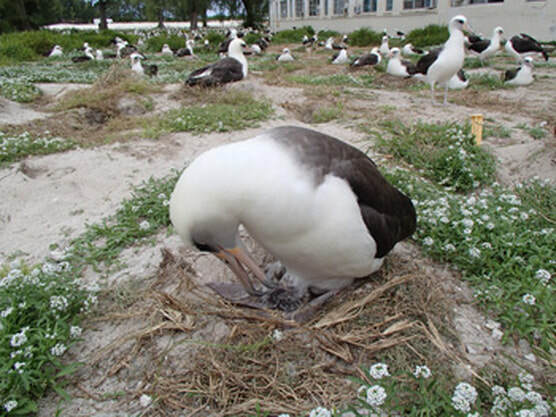 Wisdom was first banded as a nesting adult in the same location behind Bravo Barracks in 1956 and she was estimated to be at least five years old at the time, making her at least 61 years old and the oldest Laysan albatross on record. Wisdom and her mate take their parenting seriously: they've been taking turns foraging and bringing food to their chick, with one of them staying with the chick at all times. The story in 2012, told by the US Fish and Wildlife Service, was inspiring in its own right. Wisdom the Albatross had hatched still another chick. She was at least 61 years old and had lived more than twice as long as the average individual in her species. Most thought she was too old. And for that matter she had survived a tsunami, avoided an untold number of predators, and countless environmental disasters. Wisdom was a survivor. And then still another important ornithological event occurred the next year, in 2013, again at the Midway Atoll National Wildlife Refuge in the North Pacific Ocean. Wisdom and her mate successfully hatched another chick on Sunday morning, February 3. Take a look at the photographs on the left offered by the US Fish and Wildlife service. In one of them Wisdom's mate takes care of his newly hatched chick just hours after it hatched, while Wisdom is at sea feeding. And in another she has returned with food and is taking her turn at rearing duties. Yes, they take their parenting seriously. Midway Atoll was important during World War II, with the American victory there marking the turning point in the war in the Pacific Theater of Operations, but the site is no longer being used for military purposes. On Oct. 31, 1996 the jurisdiction and control of Midway Atoll was transferred to the Fish and Wildlife Service, U.S. Department of the Interior, as a National Wildlife Refuge and, as such, is open to the public. Enter renowned ornithologist Chandler S. Robbins. Born July 17, 1918, he is credited with designing the North American Breeding Bird Survey, for early work on the effects of DDT on breeding bird populations, and for studies about birds and forest fragmentation. His book Birds of North America: A Guide to Field Identification written with Bertel Bruun and Herbert S. Zim and illustrated by Arthur Singer, was published in 1966. He joined the U. S. Fish and Wildlife Service in 1945 as a junior biologist. His field work took him to many geographic regions, including Midway Island. On his first visit there in 1956 he banded 99 Laysan Albatrosses. One of the birds banded on Dec. 10, 1956 and presumed to be five years old (the minimum age for first breeding) was recaptured and banded a second time on Jan. 20, 1966, again on Feb. 18, 1985, on March 4, 1993, and in February 2002. Recaptured again on Dec. 6, 2006, the bird was given two new bands, one metal and one bright red, No. Z333. Deputy Refuge Manager John Klavitter named the bird Wisdom. She has been designated the “oldest known wild bird” at age 62 (or so). When we consider Wisdom today, some of us bring with us literary associations ranging from the historic “Rime of the Ancient Mariner” by Samuel Taylor Coleridge from early 19th century English literature to a remarkable children’s book published in 2012. The Coleridge work yields our present expression of “an albatross around one’s neck.” But it is in this poem that we also find the lines: “He prayeth best, who loveth best All things both great and small; For the dear God who loveth us, He made and loveth all. . .” known to many of us. The children’s book, Wisdom, written by Darcy Pattison, tells the remarkable life story of Wisdom. Pattison notes along the way what can happen to birds and humans from hazards in the environment—those caused by natural disasters and those resulting from human negligence and lack of environmental concern. The author has Arkansas connections, among them being the 2007 recipient of the Individual Arts Award, from the Arkansas Governor’s Arts Awards, for work with children’s literature. The book is appealingly illustrated by Kitty Harvill, who lives in Arkansas when in the U. S. and also in Brazil where she is involved in conservation efforts. She specializes in wildlife art. It is obvious that Wisdom is an inspiration for many people. Most of us know, or should know, that we are mortal beings with a destiny of death. We will not and need not live forever. Even as Wisdom survived the tsunami, thousands of birds perished. And Wisdom will perish, too. The point of life is not to live forever. It is to make the best of the days that are given to you. But what does it mean to "make the best" of your days. In her life Wisdom exhibits what the philosopher Whitehead calls strength of beauty. This kind of beauty does not have much to do with how you appear to others; it pertains more to the determination and grit that you bring to the circumstances of your life. Strength of beauty unfolds moment by moment, relative to each circumstance and also relative to age. You can see strength of beauty in Baby Wisdom on the left, too. And of course strength of beauty is in human life, too. Consider the photography of Maxine Payne, whom we profile in this website. She has a knack for photographing people who struggle against many odds to carve out lives for themselves. See The Photography of Maxine Payne. But let's be clear. We humans are creatures among creatures on a small but gorgeous planet and we are not the center of things. We are flesh among flesh in a larger community of life. Wisdom is not a moral exemplar alone; she speaks to something deep within the human soul that needs to make contact with and take inspiration from the more-than-human world. Not just intellectual contact with emotional contact. Naturalists make this contact instinctively and they are our guides. You see something of this in the eyes of Chandler Robbins in the photograph above and in the fact that he has devoted a life to helping people take delight in the world of birds. You sense something of it in two gifted artists - Kitty Harvill and Darcy Pattison -- who tell the life story of Wisdom in a children's book which is, as it happens, perfect for adults, too. Today people speak of a disease from which far too many people suffer: nature-deficit-syndrome. It is a deficit within the human heart when devoid of connection with green plants, live animals, landscapes and waterways. This more-than-human world is not supernatural but rather deeply natural. And it is also holy. The experience of the holy is not necessarily an experience of a supernatural deity, but rather the experience of something both mysterious and fascinating, something strangely different from what is expected yet deeply attractive. The holy need not transcend time and space. If we have eyes to see we find the holy throughout the whole of life, in other living beings and in ourselves. It is that quality within each living being, no matter how small or large, no matter how like us or unlike us, which elicits a sense of wonder. Buddhists call it the Buddha-Nature within each creature. Science is by no means the enemy of the holy. The more we know about things scientifically, the more wonder-filled we become because we have made contact with a world other than our own, which is beautiful in its own right. At some level, deep down, our encounter with Wisdom the Albatross is an encounter with the holy, however ephemeral it might be. And so is our encounter with so much more of the more-than-human world. Whether they know it or not, naturalists are our priests. Some are scientists, some are artists, some are storytellers. They give us stories to learn from and eyes to see. They help us find our place in the transcendent community of life.